There have been a few commodity booms over the past 200 years. Not one of these booms, including the one that unfolded over the past decade, was fueled by real economic growth or demographic changes or the rapid industrialisation of a country or region. They have all been fueled by monetary inflation. Real economic growth puts downward, not upward, pressure on prices, because real economic growth is mostly about getting more output for less input. That is, it's mostly about increasing productivity. The increase in productivity stemming from capital investment and technological change affects the commodity-producing industries in the same way it affects every other industry. That's why the inflation-adjusted price of a representative basket of commodities has been trending downward for about 200 years, despite the world's population having increased by a factor of 7 (from about 1B to about 7B) over this period. It's tempting to look at the incredibly fast industrialisation of China and the associated gain in China's appetite for commodities and conclude that it is different this time, but the evidence to date strongly indicates otherwise. The fact is that there have been several rapid industrialisations over the past 200 years and during each one it was tempting to conclude (and many 'smart' people did conclude) that it was different this time -- that the accelerating rate of commodity consumption would lead to chronic shortages and persistently higher levels for real commodity prices. However, the record of the "Malthusians" is, to date, unblemished by success. 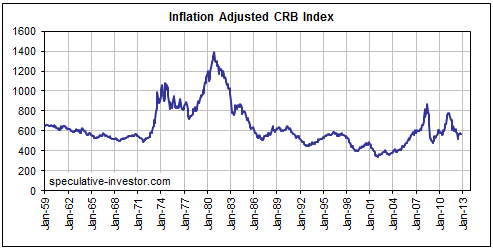 The current situation is illustrated by the chart of the inflation-adjusted CRB Index* displayed below and can be summarised as follows: Despite the massive strides made by China over the past decade, the real CRB Index is in the bottom half of its 50-year range and is more than 50% lower today than it was in 1980 (when China was still a communist basketcase). The only viable threat to the ultra-long-term downward trend in inflation-adjusted commodity prices is government intervention in the economy. Government intervention disrupts markets in ways that can lead to sustained shortages, even if the intervention is done with the best of intentions. 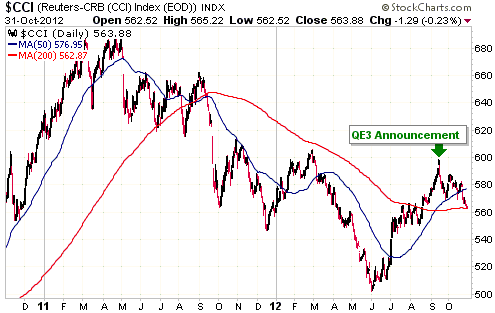 *The CRB Index was adjusted for "inflation" using the method outlined in our December-2010 article. In nominal US$ terms the price of the average commodity, as represented by the Continuous Commodity Index (CCI), peaked in April of 2011. As illustrated below, the CCI trended lower from April-2011 until June-2012. A strong rebound then got underway. The strength of the CCI's rebound from its June-2012 low suggests that the downward trend came to an end at that time. However, when we take into account the global economic backdrop and the main driver of the strong June-September advance we conclude that there is probably some unfinished business on the downside. We are referring to the likelihood of continuing global recession over the next 12 months and the fact that the CCI's rebound would have been much weaker if not for the moon-shot in agricultural commodity prices resulting from the extreme US drought. The following chart of the Industrial Metals Index (GYX) makes it clear that the drought's effect on the prices of agricultural commodities was a big contributor to the CCI's strong rebound from its June low. Whereas rocketing grain price drove the CCI sharply higher during June-July, in mid August the GYX was still near its low for the year. It then rallied for a few weeks in response to the belief that a new round of monetary stimulus was on the way, but has since given back about three-quarters of its August-September gain. The good news is that commodities in general and the industrial metals in particular are now 'oversold' as we head into a seasonally strong period. Also, sentiment is depressed, with all of the "QE" enthusiasm having been 'wrung out' by the recent price decline. 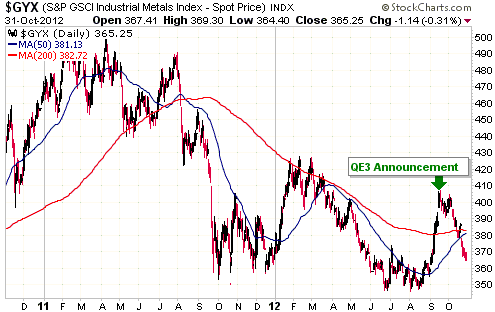 This suggests the potential for a tradable multi-month commodity rally commencing within the next few weeks. We will be looking for short-term trades relating to industrial metals over the weeks ahead, especially if there is some additional price weakness.